Due to the large amount of snags and shooting trash in the area, crews will conduct a firing operation to mitigate the risk and exposure to firefighters on the line. The fire will be expected to increase in size due to this operation. Operations normal, helicopter doing bucket drops until sunset, additional crews have arrived and are helping in constructing fireline. Night operations will have a engine patrolling the fire, Firefighters are hiking off fire for the night, numerous tree snags throughout the fire is a safety concern especially at night. 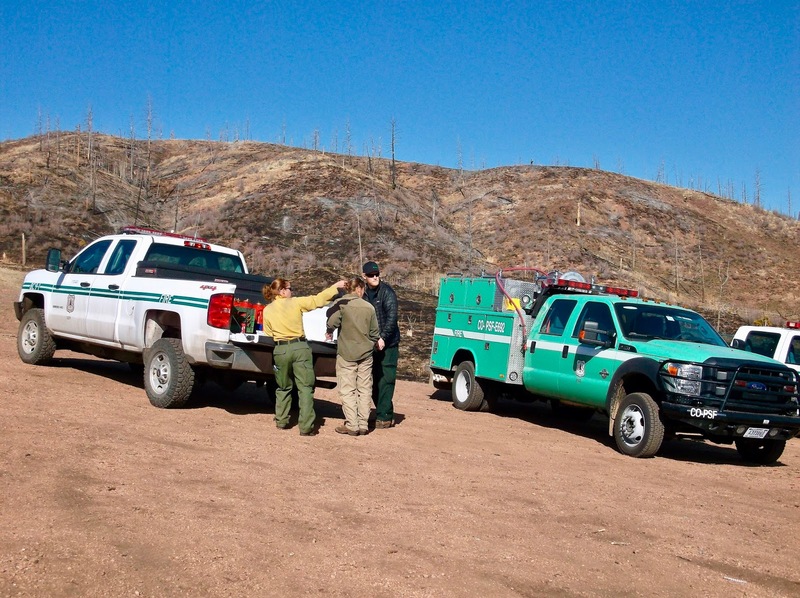 Firefighters will be back constructing and strengthening fireline early Wednesday morning. Public is asked to avoid the area by the fire. The immediate area around the Turkey Track 7 fire will be closed until further notice. This is due to firefighter activity in the area and for the safety of our firefighters as well as the public. Control lines are in around the fire and fire crews will work on continuing to secure those lines today. 2 Type 2 Hand Crews, 3 Engines, 1 Dozer will be working the fire today. We expect some increase in containment by late this afternoon as crews progress securing those containment lines. 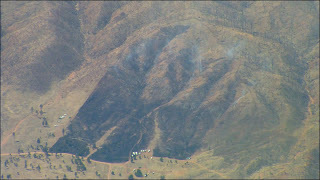 Overnight the fire stayed within those containment lines as interior snags and fuel continued to burn. Glows on the side of the hill were very visible last night from Rainbow Falls and the surrounding area. Smoke will be visible in the area north of Woodland Park today and the coming days. The immediate area around the Turkey Track 7 fire will be closed until further notice. This is due to firefighter activity in the area and for the safety of our firefighters as well as the public. 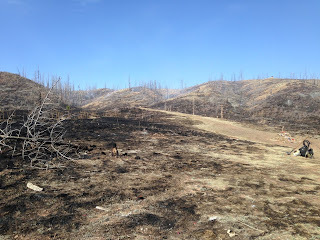 The Turkey Track 7 Fire in southern Douglas County is estimated to be about 40 acres in size as of Wednesday afternoon. Fire crews are currently working to build and secure a control line around the fire. There is no estimate of full containment at this time. 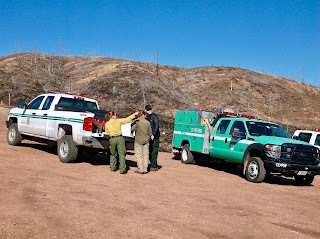 If weather conditions are favorable, Incident Commander, Amanda Disman, plans to have fire control lines secured around the fire by nightfall. The Turkey Track 7 Fire is burning on the perimeter of the 2002 Hayman Fire. Numerous trees killed by the Hayman Fire present a significant hazard to firefighters as this current fire burns around the roots and bases of these dead trees. The hazard from toppling dead trees is slowing efforts to completely extinguish this burn. Smoke from the interior of the burned area may be visible for multiple days. The target shooting area along Forest Road #343 is currently closed for the safety of the public and firefighters. This public closure may extend through the weekend, depending on when firefighters are able to secure the fire area and reduce the public hazard from fire-damaged trees. Firefighters are asking the public to stay clear of the area for everyone’s safety. It has been determined that the Turkey Track 7 Fire was ignited by human activities, the specific cause and circumstances are under investigation. This is the seventh fire ignited in the target shooting area along Forest Road #343 during the past two months. Firefighters made good progress today and the fire is now 50% contained. There are still snags burning in the interior of the fire and the glows from those snags will be visible tonight from Hwy 67 and the surrounding areas. There will also be smoke in the areas around the fire. The fire area remains closed to public use and will remain closed likely through the weekend to ensure the safety of our firefighters and the public. Additional resources arrived on the fire this evening to relieve the local engines and they will begin working on the fire tomorrow. Firefighters continue to make steady progress in securing the fire control line around the Turkey Track 7 fire and extinguishing interior hot spots. The area burned remains at 40 acres. Containment has increased to 60%. Four engines and three handcrews are on scene today. There is still quite a bit of smoldering heat in stumps, roots and around at the bases of the numerous standing dead trees in the burned area. The hazard from toppling dead trees is slowing efforts to completely extinguish this burn. Smoke from the interior of the burned area may be visible for several days. The target shooting area along Forest Road #343 remains closed for the safety of the public and firefighters. This public closure will likely extend through the weekend, depending on when firefighters are able to secure the fire area and reduce the public hazard from fire-damaged trees. Firefighters are asking the public to stay clear of the area for everyone’s safety. 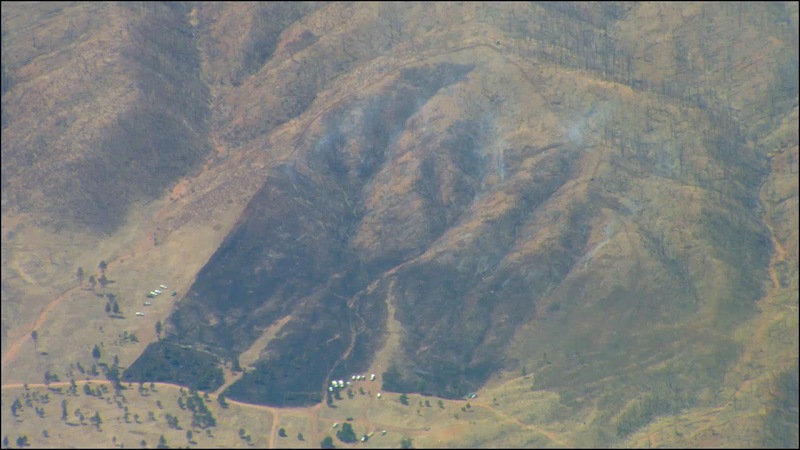 Firefighters continue to make steady progress on the fire and it is now 85% contained. There is still quite a bit of smoldering heat in stumps, roots, and around at the bases of numerous standing dead trees in the burned area. Due to the danger of falling trees/snags crews will allow the interior fuels to burn off naturally. As those interior fuels burn, smoke will be visible for several days. The area along Forest Road 343, also known as Turkey Track, will likely remain closed through the weekend. Crews continue to make progress in securing the containment lines around the fire. Fire is now 90% contained. Today's high temps, low humidity and higher winds have increased the smoldering dead trees/snags in the interior of the burned area so smoke has become more visible this afternoon. 3 Engines and 1 Handcrew continue to work the fire today. Containment for the Turkey Track 7 fire has been increased to 95%. There are still standing dead trees, stumps and other heavy fuels burning in the interior of the fire. The standing dead trees pose a significant risk to firefighters so they are allowing these to burn out naturally. They will continue to smoke for the next few days but pose no risk to the containment lines. Firefighters will continue to monitor the fire lines and the remaining smokes in the interior of the burned area. The Turkey Track fire is now 100% contained. The area is now open to the public for recreation. We ask that the public stay out of the burned area for their safety as there is still a risk of trees falling, hot stump holes (holes where stumps are smoldering? and rolling materials. There is sill the possibility of smoke to be visible in the interior of the burn which is to be expected as we are allowing the interior hazardous fuels to burn naturally. This is to reduce the risk of severe injury to a firefighter by a falling tree. If you see smoke in the interior of the burned area, please do not call 911 to report. We ask the public to please be aware of the continued fire danger and consider not shooting on hot and dry days as well as having a fire extinguisher on hand when you do any sort of recreational activity that poses a fire risk. 4/12/2017 morning view of the Turkey Track 7 fire.